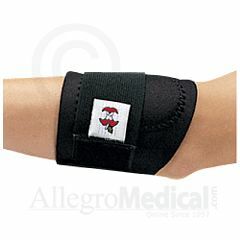 AllegroMedical.com presents The Dual Comfort Elbow Support. Contoured Neoprene Construction for Healing Warmth Our Neoprene Tennis Elbow Support helps alleviate pain due to lateral epicondylitis (tennis elbow), supinator muscle strain and tendinitis. It applies pressure below the elbow while maintaining a full range of motion. Epicondyle pad focuses gentle pressure on the lateral epicondyle and helps provide targeted relief from forearm pain. Contoured neoprene construction for warmth with hook and loop compression strap. Wear only during activity and has bilateral design. Lightweight. Doesn't get in the way. Easy to wear. Sturdy. Wear over or under shirts. Velcro is a little bulky. I love this product but was unsure of size. Description was not clear. I ordered the incorrect size & knew as soon as it arrived at my home. I ordered the smaller size and it is perfect. I had a GREAT DEAL of DIFFICULTY returning it (the larger size) to this company EVEN THO IT WAS BRAND NEW. After 6 months, FINALLY got the return authorization! Still have not seen a credit on my charge account tho.